I love eggs, always have. There’s something magical about the perfectly prepared egg, whether you like a runny yolk or a firm one, hard boiled or scrambled, eggs are one of the most perfect comfort foods on the planet. Don’t get me wrong, they’ve gotten their share of bad press, but when consumed in moderation, eggs are a great source of protein, healthy fat, and vitamins and minerals like B2 and Zinc. If you’re like me, you’ve spent a fair amount of time perfecting your egg preparation methods. If you’re not like me, I’m here for you and will explain how to handle your eggs and look like a pro! Remember, it’s important to use the best quality eggs you can find if you want to get all the health and flavor benefits from them. If you can’t get farm fresh eggs, at least read the carton labels and find free range, organic, fresh eggs. You’ll taste the difference for sure! Hard Boiled Eggs: Boil them, right? Nope! Definitely steam them! Trust me on this one. 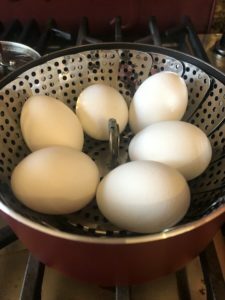 Put those babies in a steamer basket, put a lid on the pan and let them go for 10-12 minutes, depending on how you like the yolk. If you’ve ever spent way too many minutes peeling eggs, you’ll never go back! The shells slide right off, and it could be my imagination, but the egg seems silkier than when you boil them in water. 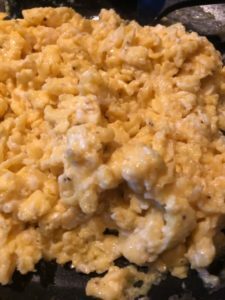 Scrambled Eggs: Slow and Low is the key! I used to throw some olive oil or butter in a saute pan and scramble super quick over high heat. Nope, not any more. Melt your butter, turn down the heat, crack your eggs and stir, stir, stir. Add a little salt and freshly ground pepper. Stir, stir, stir. The first couple of minutes it seems like it’s going to take forever, but as soon as the eggs start to firm up, you’ll be convinced. No more rubbery, dry scrambled eggs. Stir until everything is just firmed up, but not raw. Welcome to creamy, luxurious scrambled eggs. Add a little bit of shredded cheese to make them even more magical. 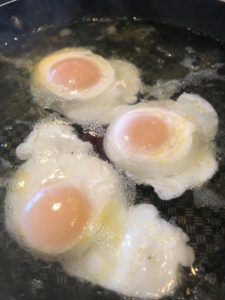 Fried Eggs: I love the perfectly “over medium” fried egg, but don’t always complete the flip without breaking the yolk. Nope, no more flipping. Melt your butter, turn heat down to low, crack your eggs into the skillet and cover with a lid. Let the steam cook the whole egg, while the low heat doesn’t burn the bottom. Cook that yolk to your heart’s desire. Runny, medium, hard. It’s all good. You’ll know the yolk is starting to really cook when it starts to cloud over a bit on the top. Enjoy! 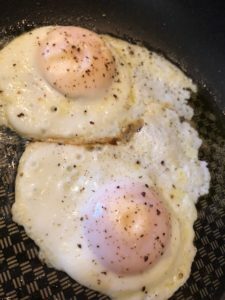 Poached Eggs: These are not hard!!! Believe me! Want to know the trick? Vinegar! Yup, vinegar is your key to the perfectly poached egg. Melt a little butter in the bottom of a saute pan to keep the eggs from sticking while cooking, then add about an inch of water. Now add 2-4 Tablespoons of vinegar to the water and heat to a low simmer. Slowly add your cracked eggs, one by one and keep an eye on them. I like to lift them a bit from the bottom once they start to turn white. Depending on how cooked you like your yolk, you can baste the yolks with the hot water, or even carefully flip the egg so the yolk cooks from the bottom. When they’re cooked to your liking, lift them out onto paper towels with a slotted spoon and season with salt and pepper. Voila! There you go. Now go buy a dozen eggs and wow your friends and family with your egg-spertise!